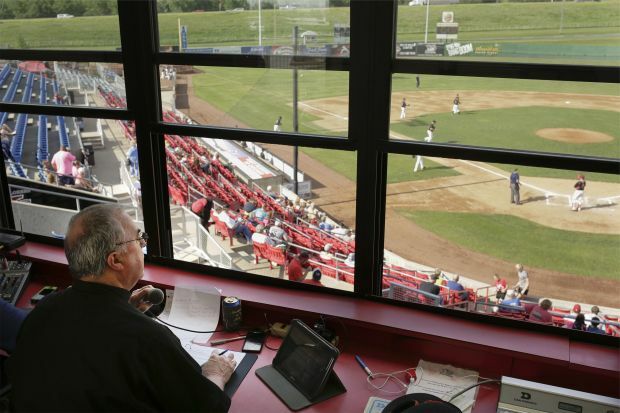 SIOUX CITY, Iowa (CNS) — From the back, all the men in the press box at the Sioux City Explorers baseball game looked the same. That is, until one swiveled in his seat to take a swig of his Pepsi and the white of a Roman collar appeared. 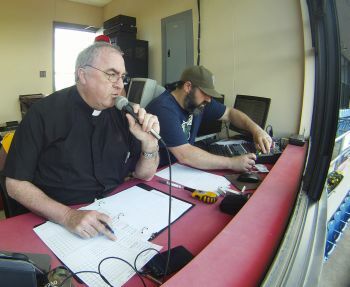 For the past decade, Father Craig Collison has been the play-by-play announcer for the Xs, whose home ballpark is Lewis and Clark Stadium in Sioux City. Father Collison commits to the home games of the Explorers for the season, with a particular caveat. Unlike others in the press box who may be there as part of their employment, Father Collison is there because he enjoys it. Father Craig Collison, a priest in the Diocese of Sioux City, Iowa, reads off his list of players as he introduces the Sioux City Explorers baseball team members in their game against the Gary, Ind., Southshore Railcats from the press box June 4. Father Collison gets a great deal of pleasure with being associated with the game. “I was never the athlete,” he said. “My brothers and my sister were, or my nieces and my nephews are. I always thought, however, that I understood the different sports I was interested in very well, and started to officiate, umpire baseball and later refereed volleyball. With those joys come some stresses, Father Collison clarified, and they may be associated with the yellow walkie-talkie within his arm’s reach. Fans tell Father Collison they like the “sound” of his voice. The games also allow Father Collison an opportunity to evangelize; thus, why he wears his collar. Believe it or not, Father Collison pointed out, priests still do many of the same things “regular people” do and don’t need to give them up to perform their ministry as a priest. It may even lead to someone heeding the call to the priesthood or religious life, Father Collison speculated.